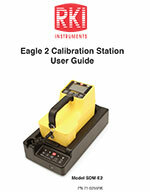 The SDM-E2 can also be connected to a PC for automated calibration bump testing and archiving of datalog data from Eagle 2 instruments. Up to ten SDM-E2 docking stations can be connected simultaneously using USB cables. 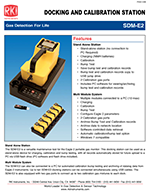 The SDM-E2 is also equipped with two gas ports to connect up to two calibration gas mixtures to the multi module system. AC Adapter with 100 – 240 VAC, 50/60 Hz, 0.6A input and 112 VDC, 1.2A output provided as standard. *Bold features indicate differences between the various versions of the docking stations.